^ Hit up expedia, and just search for stuff close to the Hampton Coliseum. There is plenty of stuff in that area. Thanks man, thats what I ended up doing. Are you coming up? I think Eric is still coming right? Thats cool, let me know if you change your mind. Talk to you later. If any of you guys are really hard up for a place to stay, shoot me a PM and I'll see what I can do. Just a week away guys! If anyone can bring any extra track be sure to pm me! I will post a track layout tomorrow, however, its subject to change as I'm going to have to assume the amount of track. Looking forward to racing. Reflex racing has a sponsorship package on the way! Looks like this race is coming together pretty nicely. Plenty of parking! As said before, if lodging is an issue PM one of us and we'll help find a solution! I'll go ahead and say I'll take any reasonable lodging for fri-sat nights. Bad news... I won't be able to attend. My brother-in-law passed away last night and the services will be this coming weekend. I'm sure there will be other races though! Good luck all and take lots of pics! My condolences. Take care of family. Thanks! Is anyone coming through PA to get to this? Brandon still needs more track for this event. I've been offered up to three wide L's from Jeremy. I guess the limitation will be how much we can fit in Maya's sedan. This should improve our situation significantly. i'm brining 2 tracks as well. Of course we'd rather you be racing with us, however, I understand that some people have stuff going on. Thanks for helping with the track! Hopefully you can make it next time. I'll make sure its bigger and better next year! Okay! Here is the track layout! I hope everone likes it. Last year was the Japanese track Motegi. 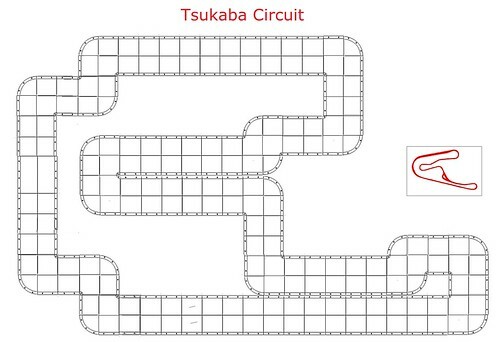 This year I bring you the Japanese track Tsukaba circuit! Last edited by Action B; 2009.11.03 at 01:58 PM.